Dudley Nichols’s Mourning Becomes Electra has its staunch defenders, but so does every other awful movie. Mourning Becomes Electra is unquestionably the worst movie I have seen so far this year, and it’s unlikely that I will see another one that’s as bad in the short time remaining. If I did “worst of the year” lists, it would almost certainly be at the very top. I’ve got nothing personal against Rosalind Russell, but if I’d been a member of the Academy 64 years ago, she could have given me a brand new Lincoln Continental, a sable coat for my wife, and one hundred thousand dollars in cash, and I still wouldn’t have voted for her. It’s not just that her performance is so one-note and hysterically pitched, but also that the entire film is so ineptly directed that each actor in the film seems to be directing him- or herself. Mourning Becomes Electra is a film version of Eugene O’Neill’s play cycle of the same name, which was a reimagining of the Oresteia trilogy by Aeschylus. Instead of Agamemnon returning from the Trojan War to his wife Clytemnestra, his son Orestes, and his daughter Electra, a Union general named Ezra Mannon returns to Massachusetts from the Civil War to his wife Christine, his son Orin, and his daughter Lavinia. Just as in the Greek myth of Orestes, Ezra Mannon is murdered by his wife, and her children plot to avenge their father’s death. Just like O’Neill’s original play cycle, the film is divided into three parts, Homecoming, The Hunted, and The Haunted. Of course, the play is more than just a retread of classical Greek tragedy. O’Neill was also strongly influenced by the Freudian psychosexual theories that were in vogue in the ’30s. 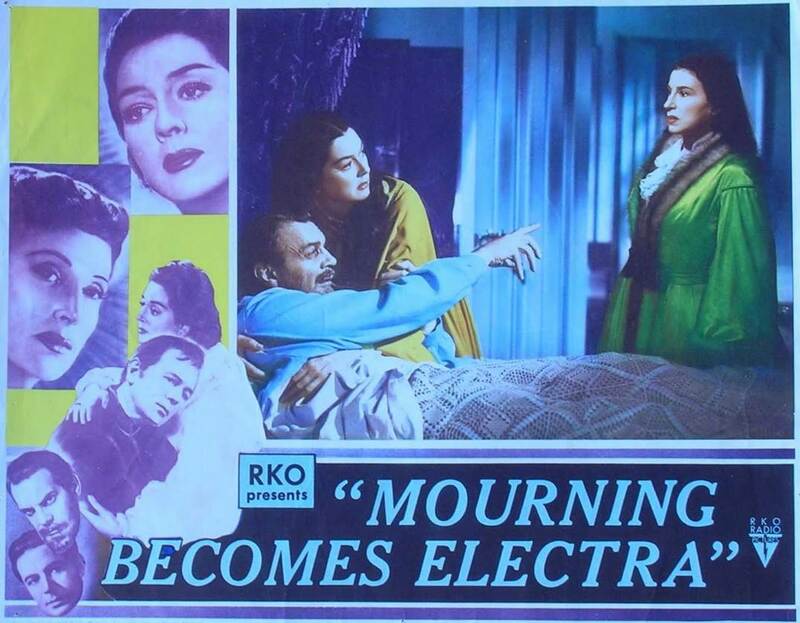 However, for a movie with kissin’ cousins and freaky Oedipus complexes, Mourning Becomes Electra sure is boring. The problems begin at the beginning. The first scene of Homecoming involves Seth Beckwith (Henry Hull), the Mannons’ groundskeeper, leading a small group of townspeople around the Mannon estate and explaining all the characthers’ names and relationships. It’s obvious that Seth and the townspeople are meant to function as a Greek chorus, but it’s too much information too soon, and without any context, it’s mind-numbingly boring. In Homecoming, Christine Mannon (Katina Paxinou) and her daughter Lavinia (Russell) howl at each other for awhile over the affections of officer Adam Brant (Leo Genn), who it turns out is the product of an illicit coupling between a Mannon male and a lowly housekeeper, both of whom were expelled from the house. 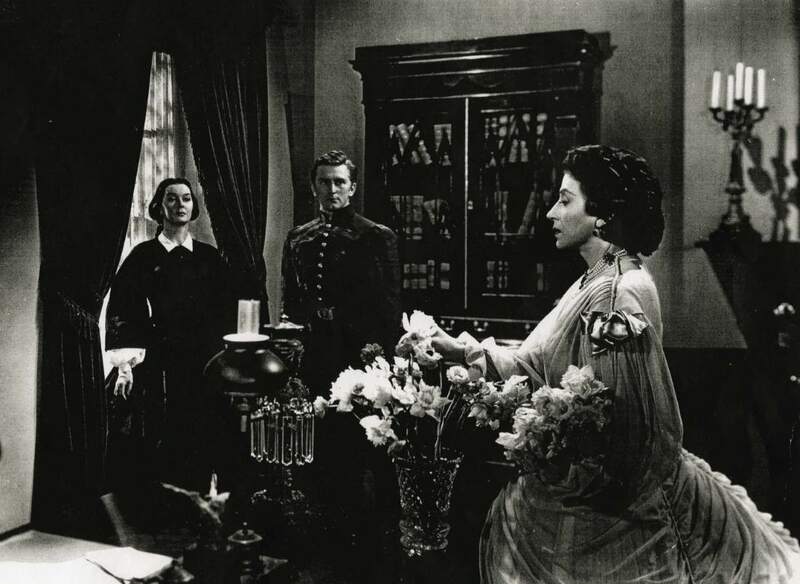 Brigadier General Ezra Mannon (Raymond Massey) returns home, and his wife conspires with her lover, Adam, to poison him. Ezra accuses her with his dying breath. In The Hunted, Orin Mannon (Michael Redgrave) returns home and spends a lot of misty-eyed time with his head in his mother’s lap. Eventually his sister Lavinia convinces him that Adam Brant and their mother were responsible for their father’s death, so they sneak aboard the ship The Flying Trades and kill Adam after they observe Christine’s rendezvous with him. Following Adam’s murder, Christine shoots herself out of grief. In The Haunted, Orin and Lavinia return home after a romantic year-long getaway to the South Seas. When they return to Massachusetts, their friends — a slightly less dysfunctional pair of siblings, Peter Niles (Kirk Douglas) and Hazel Niles (Nancy Coleman) — are disturbed by the changes Orin and Lavinia have gone through. Lavinia plans to marry Peter, but Orin threatens to reveal all of their crimes to Peter if she goes through with her plan. Orin tries to molest his sister, and kills himself when she rejects him. Then, instead of marrying Peter, Lavinia shuts herself up in the house forever. The end. The main problem with Mourning Becomes Electra is how uninteresting and stagy the direction is. 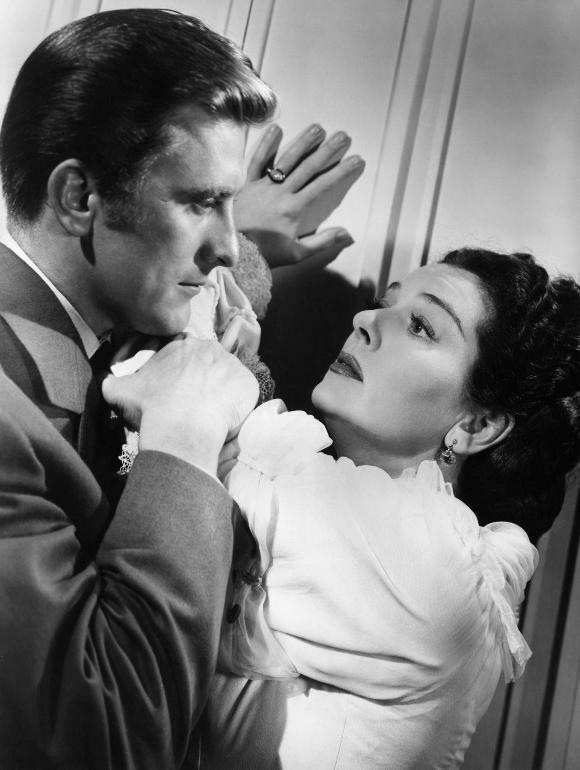 (Dudley Nichols did much more work as a writer than as a director, and Mourning Becomes Electra was the last film he ever directed.) This does not mean, however, that it is a faithful adaption. The demands of cinema are very different from the demands of the stage. Simply running through the lines of a stage play in front of a camera is a very different proposition than performing a play night after night in front of an audience. As a film, Mourning Becomes Electra is a “faithful” adaptation of O’Neill’s play in the same way a film of an elderly British man reading Great Expectations aloud for 19 hours could be called a “faithful” adaptation of Charles Dickens’s novel. It also doesn’t help that nearly everyone in the cast has a wildly different accent from everyone else, and that nearly everyone is the wrong age for the character they’re playing. The “young and handsome” Adam Brant is played by Leo Genn, a square-headed, fat-lipped 41-year-old British actor. Lavinia is supposed to be a young woman, but Rosalind Russell was 40 (or nearly 40) when she appeared in Mourning Becomes Electra, while Katina Paxinou, who plays her mother Christine, was only 46. This closeness in age could perhaps be overlooked if the two actresses were on the stage together, but on film, it’s distracting. Also, Paxinou’s thick Greek accent could perhaps be explained by her marrying into the Mannon family, but how to explain Michael Redgrave’s British accent? The psychosexual and incestuous drama of Mourning Becomes Electra is obvious and ham-fisted. This is a film that is likely to be praised as “Freudian” only by people who have never read Freud. It’s also a film that is likely to be praised only by pretentious dilettantes who think that merely by forcing themselves to sit through something long and crushingly boring they are engaging in a high-minded activity. Posted in 1947, November 1947 and tagged Drama, Dudley Nichols, Eugene O'Neill, Katina Paxinou, Kirk Douglas, Leo Genn, Michael Redgrave, Raymond Massey, RKO Radio Pictures, Rosalind Russell. Bookmark the permalink.